Next weekend is Mother’s day. I am both a mother and a daughter. I contribute almost every good trait and aspect of my life to my mother. Her name is Norma. She was and always will be the finest person I have ever known. I don’t say it because she was my mother. I don’t say it because she was my best friend, she was. I say it because I knew her and what her life was; where she came from and what she managed to accomplish. No you won’t find her on your search engine. She made the world she lived in….a very small world, better. My mother was born in New Orleans in the summer following the Great Mississippi Flood of 1927 to immigrant parents. She received only a high school education and married a man she had only known for a weekend. She moved to Kansas and stayed married (at first because she didn’t want to hear her mother say “I told you so”) for more than 50 years. She was a working mother and raised 7 children to be good people. She made everyone laugh and feel welcome in her company. She was always looking for ways to make things better. They didn’t have to be big things, they just had to matter…and matter they did. My father told me I could be anything I wanted. My mother showed me how to get there. I was her only daughter. She was an only daughter. Maybe it was because of this that we learned we had a lot in common. Ours was never a battle between 2 women. I admired her, she was proud of me and vice versa. She taught me how to ask questions and how to listen to the answers. How not to be stopped by obstacles in my path, but the many ways around them. She was the only woman I’ve ever known whose mind worked like mine did. Hardly a day will pass when I do not think of her and smile. You may have guessed by now that Norma is no longer alive. Yes and no. My mother passed on awhile back. She was a victim of dementia and was stolen from us all in bits and pieces. The most vibrant woman I have ever known reduced to a tiny shell that recognized very little at the end. In those 7 years I learned to appreciate the smallest little wonders. The days she said my name were special. Even at the end, her smile could still light up a room. I wish I could remember everything she told me, but I know that I do remember the most important things. To treat people like the kind of person you know they can be, maybe that will help them to figure it out. Try to make someone smile…even if just for a moment. It could be the most important thing you do that day. Laugh…mostly at yourself….how else will you learn to grow? And to always cook for those you love. Make the meal something worth eating. Its the love that makes you grow…the rest is just food. Love makes it sustenance. 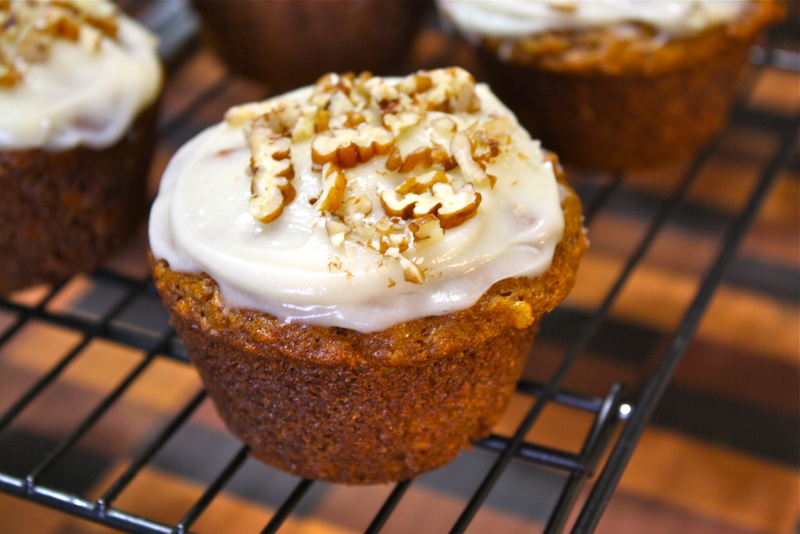 One of my mother’s most famous dishes was her Carrot Cake. I have tasted very few that even come close. So for Mother’s Day I have decided to share it with you. Maybe it will help you to make your own little world….better. In your mixer’s bowl, beat oil, sugar,(molasses), eggs and vanilla together. With the mixer on low speed, add dry (flour mix) ingredients and beat until just combined. 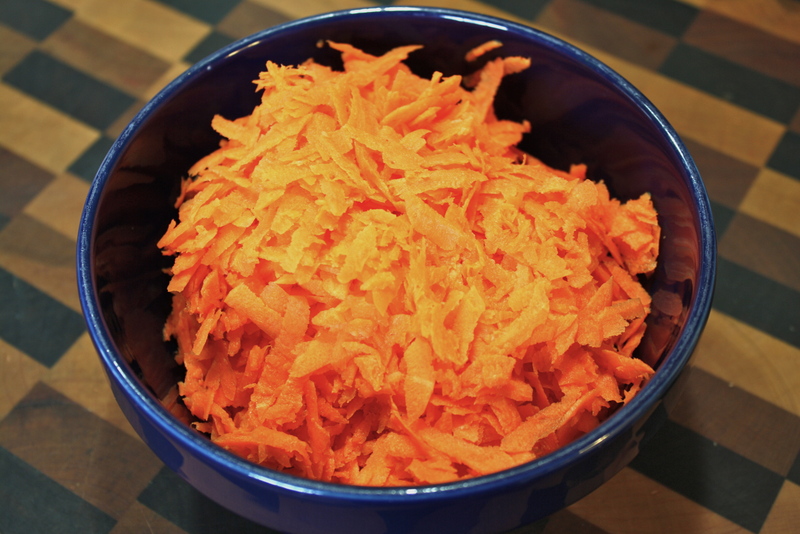 Add carrots beat again (just a few seconds worth). Add coconut, raisins, nuts mix and pineapple in juice. Mix until just combined. Remove the mixer paddle and use a spatula to give it the last few stirs. Be gentle and you will be rewarded! 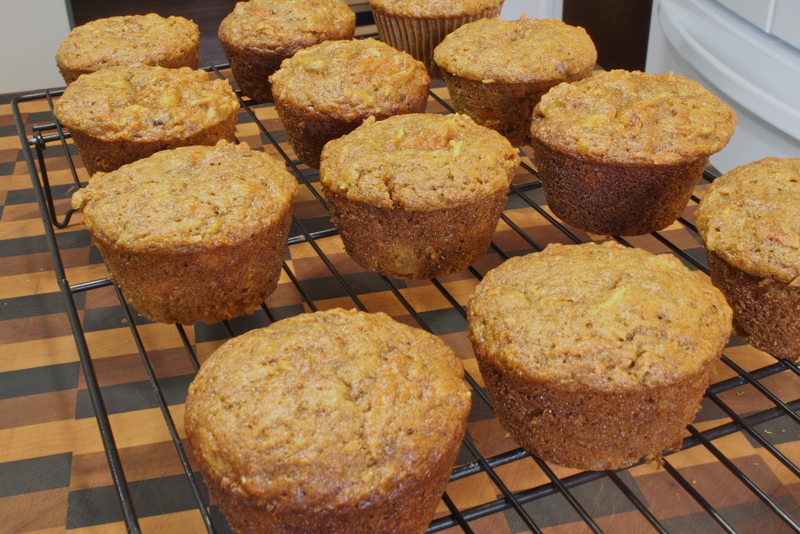 Pour into a greased 13 X 9 inch pan or 8 mini loaves with 8 cupcakes or 18 cupcakes. Bake for 50 minutes for cake, 30 minutes for the mini loaves or about 25 minutes for cupcakes (toothpick check is almost clean). Share these with someone you love and maybe make them smile, even if just for a moment. Enjoy! 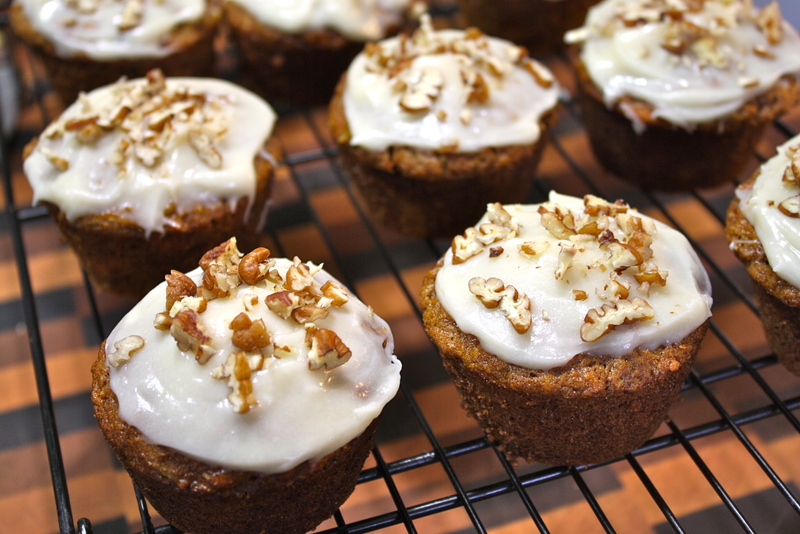 Wonderful little carrot cakes – gorgeous! Those are so pretty! They look delicious. My son’s says they are incredible. They make your mouth say “WOW!” Can you tell I like them? What a wonderful tribute to your mother. The muffins look delicious. What a great tribute to your Mom.She (& Bee) always made me feel welcome and she was certainly FULL of LIFE. You will not be disappointed with the cake. I’m sorry about your mom. It is very hard. I do think I know where her ornery went. Beautifully written, I hope my siblings read it…good cake too! Happy Mother’s day in advance. Thanks bro! A big thanks to Crystal for saving her recipe. A Wonderful tribute to a great Lady. Well written. Happy Mothers day to you. Thanks Rus. Get Linda to make the cake for you. It’ll take you home with the first bite. Very eloquent writing and tribute to your Mother. I will always remember her smiling face and she always welcomed us into her home with open arms. Made me cry to remember all the good times. Happy Mother’s Day to you! I will try to cook Aunt Norma’s carrot cake but I’m sure it won’t turn out as good as hers! You might be surprised….Mom was not a fancy cook. Just follow the directions and you’ll be fine. Just don’t use baby carrots for the carrots. The mature ones are much sweeter and will hold up well in the baking process. Let me know girl and thanks! I’m not a big frosting person myself, but I was trying to “go with the flow”. Glad you liked it!